When a patient, site or study team member has an issue or question in your clinical trials, do they know who to call? Often the reality is somewhat less than ideal. 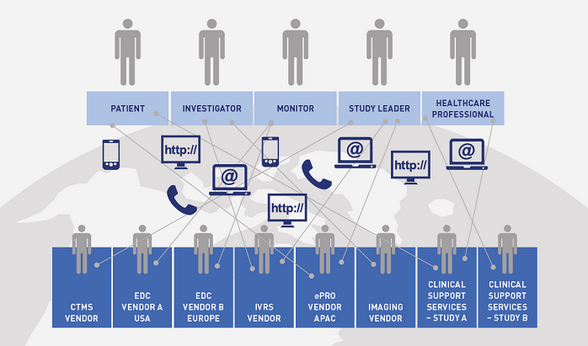 Does your clinical trial helpdesk support network look like this? Delivering support to patients, sites, study teams, and other healthcare professionals can be complex if you have multiple providers of eClinical technology and clinical services. On top of that, with sites in different countries, different time zones, and speaking different languages, it’s challenging to provide a consistent level of high quality response to queries and issues. Clinical services, including: patient recruitment support, emergency enquiries and escalations, patient enquiries, engagement and compliance support, site support and training, protocol queries, and code break. Medical services, including: safety surveillance, medical inquiries, adverse event reporting, and product complaint handling. Drug supply support, including: manual medication release, drug accountability, expiry management, laboratory enquiries, and consignment management. eClinical technology support, including: patient data queries and amendments, user administration, and help for use of multiple vendors' applications such as CTMS (Clinical Trial Management System), IRT (Interactive Response Technology, also known as IVR/IWR), medical imaging, eCOA (electronic Clinical Outcome Assessment), EDC (Electronic Data Capture), site start-up, safety systems, and RIM (Regulatory Information Management). With this type of global contact center solution, patients, sites, study teams, and other healthcare professionals know who to call when they have a question, issue, or emergency related to the clinical trial. View a short video to learn about PAREXEL's Customer Care Services for clinical trial support.